An air filter does what it says on the tin, it filters out any dust and dirt from the air supply so that only clean air enters the engine. When deciding how often you should change your air filter, be sure to consider a few factors, such as how many miles your car has driven, and in what environment you drive your car in. For example, if you often drive on unpaved and dusty roads, then your air filter will probably need replacing more often. If you remain unsure of how often you need to change it, you can refer to your vehicles service schedule, which will outline when serviceable components, such as the air filter, need changing. How Do You Know When To Replace The Air Filter? Air Filter Looks Dirty – Opposed to a new white or off-white air filter, a used one will have a darker appearance, due to a build-up of dust and contaminants over a long period of time. Black Smoke Leaving The Exhaust – Reduced air flow to the engine, due to a dirty air filter, can cause incomplete combustion. This will result in carbon deposits, commonly known as soot, exiting the exhaust. Strange Engine Sounds – If you have the engine running but you are not moving, and the usual smooth, humming sound is replaced with a coughing noise, then it may be due to a damaged spark plug. As mentioned above, a dirty air filter can cause the formation of soot, which can amass around the spark plug, causing the engine to misfire. Poor Fuel Efficiency – A dirty air filter will result in your fuel economy decreasing. To make up for the reduced oxygen supply caused by a filthy air filter, your car will increase its fuel consumption, in order to generate enough power. So essentially, maintaining a clean air filter can help you save on fuel expenses! Now, on to the important part, how to change the air filter yourself. You may feel nervous when attempting to do a DIY job, but if you follow the step by step process below, then you should breeze through it without a problem. 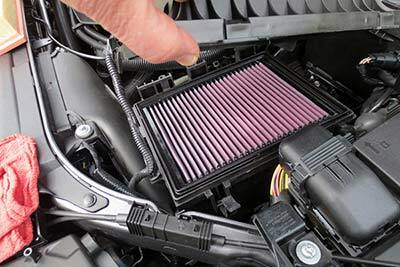 Obtain a new filter, ensuring it is the correct type for your car. Firstly, lift the bonnet and locate the air filter, which is usually situated at the top of the engine in a container called the air filter box. The container holding the filter will be sealed closed, so remove any screws or clasps, ensuring you keep them in a secure place, as you will soon have to close it shut again. Once the container is opened, take the old air filter out and compare its size with the new one, to ensure they are exactly the same. Also, you often find a build up of dirt and debris in the container after removing the used filter, so be sure to clean it with the cloth before fitting the new one in. Observe any markings that may specify which way to install the new air filter and fit it correctly. Once the new filter is slotted in securely, you can seal the airbox back up. Ensure the screws or clasps are placed where you originally removed them from and that they are secured tightly, and then finally shut the bonnet. Give yourself a pat on the back, the task is completed! If you lack the confidence in replacing your vehicles air filter yourself, then contact Sinspeed, we offer an air filter change as part of a major service. Tags : Changing Your Air Filter, How To Change Your Air Filter, How To Replace Your Air Filter, Replace Dirty Air Filter, Replacing Your Air Filter.